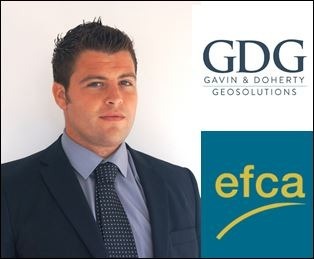 The European Federation of Engineering Consultancy Associations (EFCA) has announced that Paul Doherty of GDG Geosolutions is the winner of the eighth EFCA Young Professionals Competition. Paul (31) is the Managing Director and one of the founding partners of specialist geotechnical engineering consultancy, Gavin and Doherty Geosolutions (GDG). Paul project managed the winning entry “The Irish Rail Cutting and Embankment Decision Support Tool Project”. He developed and successfully delivered the final software programme that is now one of the most sophisticated risk ranking systems used by transport network managers worldwide. He presented the project at the EFCA 2017 conference on June 1st-3rd in Copenhagen.